We are glad our good mouser “Eddie”, survived his brush with an Eagle . Oh, my gosh. What happened exactly? Details, please. Eddie is adorable. Well, I won’t give you the awful details, but poor Eddie’s wounds were awful. After the swelling went down, the extent of the injuries became apparent and we considered putting him to sleep. But he never appeared in pain, allowing us to treat the wounds and eating and drinking well. Day by day he slowly began to heal. 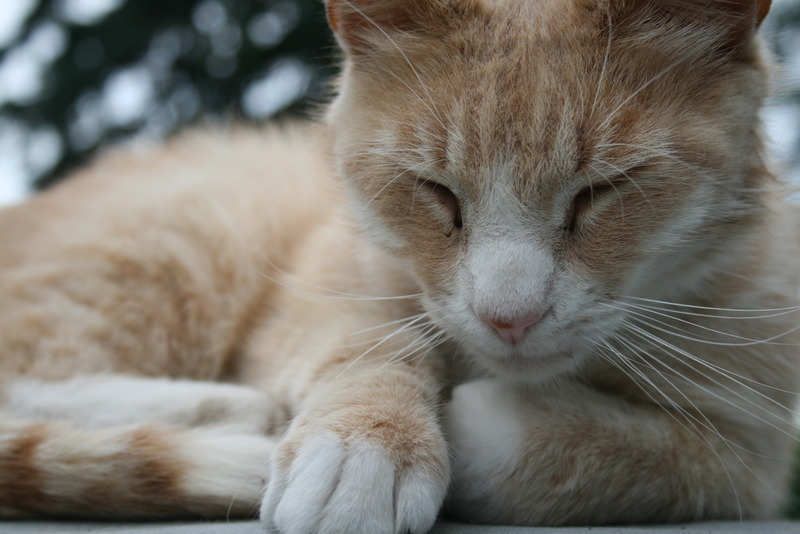 The day I found him sunning out on the little deck on Rabbit Run Cottage–I was so happy. His fur is still growing back around his neck, and the skin delicate–so every couple of days I cut a section off the sleeve of an old wool sweater–he has a little Winter wool scarf! And he stays closer to home! o no, poor kitty. Our cats live downtown and are inside only. I can’t imagine your worry. Thank goodness you didn’t lose him, Eddie is very sweet looking. He is a sweet cat, he loves to snuggle the dogs! He really used up some of his lives on that encounter! Seriously? Seriously!! I’m glad, too! We actually lost 3 chickens and 2 other cats last Spring from the Eagles! They swoop right into our yard! And they are silent, you can not hear them! Eddie 1 Eagle 0. Good job escaping, Eddie. I think his size is what saved him–he is a big guy and must have weighed to much! What a story. Lucky that he has 8 more lives!